I predicted 2011 was going to be a big year for Sony and they just came through in a big way. Last week they announced four new cameras, including the 24-megapixel Sony Alpha SLT-A77. The A77 is Sony’s new top-of-the-line transparent mirror SLT camera and the follow-up to our 2010 Camera Of The Year, the Sony Alpha SLT-A55. Although the A77 may look a lot like the mid-range digital SLR you have in your camera bag now, it’s anything but. Sony’s SLT cameras replace the traditional hinged mirror and optical viewfinder used in an SLR with a fixed, transparent mirror and electronic viewfinder (EVF). The transparent mirror allows the SLT cameras to use superior phase detect auto focus for live view and movies as well as stills. The A77 builds on that auto focus advantage with a new 19-point auto focus system and what Sony claims is, “the world’s fastest continuous autofocus (AF) shooting performance,” capable of bursts at 12 frames-per-second. The A77 also gets separate aperture and shutter speed control dials, a brand-new groundbreaking 2.3 million-dot OLED EVF, a 3-way adjustable 3-inch LCD display and full HD video with selectable frame rates. Sony tested the waters last year with their first SLT cameras, the SLT-A33 and SLT-A55. Those cameras were priced and spec’d to compete with entry-level consumer digital SLRs. The A77, on the other hand, was designed for serious photographers A whole bunch of details, like 1/250th second flash sync, 150k shutter, magnesium weather-sealed body and dual exposure control dials, put it squarely in the prosumer DSLR category. 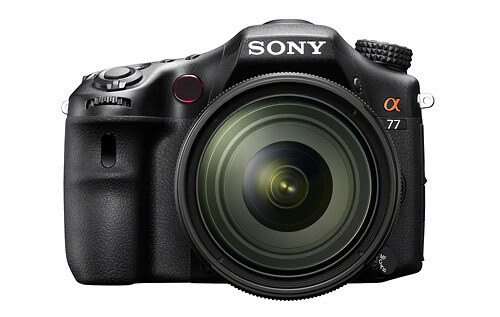 And just as they did with the A55, Sony raises the bar with the A77. Even though it’s meant to compete with prosumer cameras like the Nikon D7000 and Canon EOS 7D, the 24-megapixel sensor, auto focus performance and 12-frames-per-second burst capability also make it a viable alternative for photographers considering cameras like the full frame Canon EOS 5D Mark II and possibly even top tier pro DSLRs like the Canon EOS-1D Mark IV and Nikon D3s. 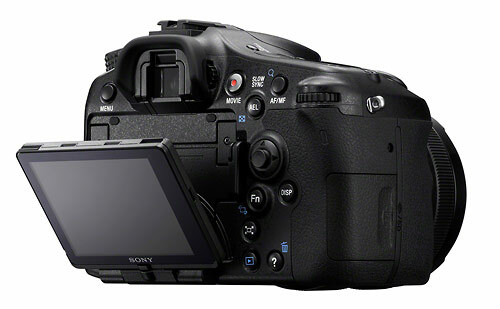 For videographers the A77 will have an even stronger draw. Since it was introduced in 2008, the Canon EOS 5D Mark II has been the standard for DSLR video. With 1920 x 1080 AVCHD, selectable frame rates (60i, 24p, 60p), an adjustable LCD display, working eye-level finder, and useable continuous auto focus, the A77 is going to be a real contender for the top HD DSLR spot the 5D Mk II has held for so long. The only video feature it doesn’t appear to have is adjustable sound level control. Although I make a lot of “unboxing” and camera intro videos, I’m primarily an outdoor and action sports still photographer. So I always pay close attention to the still photography capabilities of cameras when I’m analyzing, comparing and reviewing. The A77′s 12-frames per-second maximum burst speed is faster than even Canon and Nikon’s current top-of-the-line pro sports DSLRs. The 12 FPS burst is actually only available in the Continuous Auto scene mode – not a shooting mode you’d find serious sports photographers using. However, the standard high-speed burst, available in manual exposure modes, is still a very fast 8 frames-per-second. That’s not as fast as the Nikon D3s and Canon EOS-1D Mark IV. But those cameras cost $5000 and 8 FPS is still faster than the Nikon D7000 and Canon EOS 7D, the cameras the A77 was meant to compete with. When I reviewed the SLT-A55, the only real complaint I had was the auto focus wasn’t quite as accurate as the Nikon D7000 and Canon EOS 7D, cameras it wasn’t even intended to compete with. But the A55′s overall performance was so good I naturally compared it to those cameras. The good news is Sony has given the A77 has a new 19-point auto focus system with 11 extra-sensitive cross-type sensors that should offer noticeably better auto focus performance. 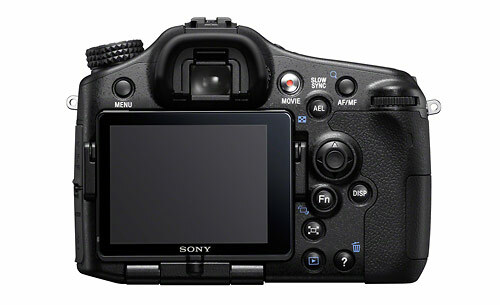 It will be a huge achievement for Sony if the A77′s AF can match Nikon and Canon’s prosumer cameras. If they’re able to do that, the only thing they have left to address is their lens and accessory selection. Image quality is the big question with the A77. Basically, 24-megapixels is a lot of pixel density for an APS-C crop-sensor camera. No doubt, Sony has worked some in-camera noise-reduction magic on the sensor to get the best possible image quality. But experienced photographers and camera industry analysts will all be asking why Sony decided to use such a high-resolution sensor. Is there a real benefit other than just being able to claim the camera has a 24-megapixel sensor? Personally, that’s more resolution than I want. It means more memory cards, more hard drive space and more time spent in front of the computer crunching those big files. There are sample photos on dpreview and they look better than I expected (Sony Alpha SLT-A77 sample photos). I think the A77 should be usable to at least ISO 3200. On the other hand, the image quality would probably have been even better if they’d used a lower resolution sensor. More is not always better. Along with the new Sony NEX-7 compact system camera, I think the Sony Alpha SLT-A77 is one of the most interesting cameras introduced so far in 2011. Sony continues to blur the lines of camera design and they’ve solidly established themselves as one of the most innovative camera makers of the past couple years. I liked what the SLT transparent mirror platform had to offer last year in the A55 and the overhaul job Sony did in the A77 is very impressive. I’m looking forward to trying it out to see how it compares to the A55 as well as the best that Canikon have to offer. The Sony Alpha SLT-A77 will be available in October along with a new moisture and dust-resistant DT 16-50mm f/2.8 SSM zoom lens and battery grip. 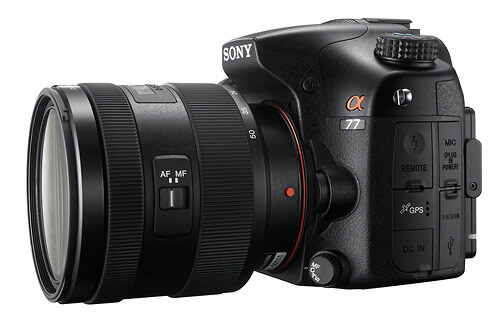 The projected price for the A77 is $1400 for just the body or $2000 in a kit with the new 16-50mm f/2.8 lens. The lens and grip will sell separately for $700 and $300, respectively.